For Women: Miguel’s primary gift is a profound catalytic Sacred Masculine energy transmission that may be experienced in a variety of different ways. On the surface your session is a conversation and experience of what it is to be held safely and tenderly in the loving strength of the Sacred Masculine. This enables women to journey deep with themselves so that they can heal their own masculine and /or feminine essence. Whatever is needed will be illuminated and seen by Miguel’s energy. Women also often experience a renewed trust and faith in men and a new found belief in the potential of deepening or finding a new loving relationship. Scroll down to the calendar to schedule your initial 30 minute session now. This is a special introductory offer for your first session only at £44.00 (US $56.00) When you have scheduled you can pay by using the PayPal button at the bottom of this page using loveinaction@migueldean.co.uk Thank you. 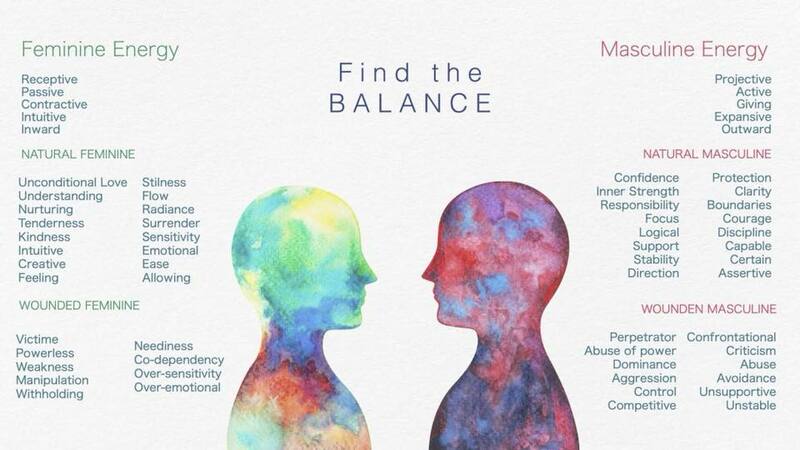 Now is a good time to consolidate balance and union between the twin flame masculine and feminine principles within. As we each work on our inner marriage, the positive changes are reflected in more peace, love and harmony in the external relationships we experience in our lives. As a result of generations of dysfunctional male and female relationships, many people have huge issues involving trust, respect and fear. These distorted or shadow aspects within men and women have been predominant in the old paradigm for too long. Now is the time of the rising and union of both the Divine Masculine and the Divine Feminine. For too long humanity has been lost to the truth of what it means to be an authentic, true and loving man or woman. Miguel’s inspiring, personal journey and his wisdom acquired along the way make him the right facilitator for healing these often fundamental and primal wounds. Having dissolved and healed a series of deep mother and father wounds from his own childhood, he is now divinely guided to facilitate and inspire the creation of more wholesome and solid foundations of love and truth between men and women. This exciting work is another strand of his passion to take care of the generations to come, as healthy adults rear healthy, balanced and happy children who will become responsible and caring custodians of Mother Earth, each other and all sentient beings. By Email (write to Miguel and he will always respond within forty-eight hours. He will keep a tally of his time and let you know each time you have reached an hour of Sacred Masculine Session time). 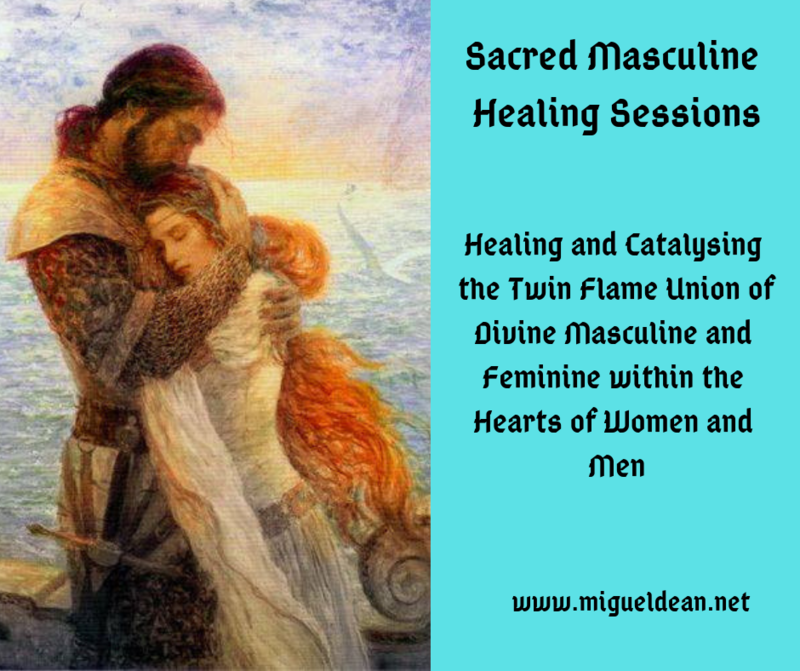 What can you expect from a Sacred Masculine Session with Miguel? A powerful healing energy transmission of pure universal energy which acts as both a healing catalyst and safe and sacred container. Miguel’s integrated inner feminine energy enables him to listen deeply and to be compassionate, caring and empathic which facilitates healing within. His inner masculine often comes into play in empowering clients to make practical changes in their lives, which will assist them externally in their journey to wholeness. Miguel is an intuitive seer and his soaring eagle perspective enables him to bring to awareness what had previously remained hidden from the client. This enables the shadows of the unconscious to be brought into the light of consciousness. Tears are a powerful medium for release. With Miguel clients feel so safe and held by his loving, sacred masculine energy, that they can access the most tender parts of themselves and release the old stuck emotions in order to make way for greater health and peace. Miguel’s keen sense of humour is also powerful and enhances the richness of the Sacred Masculine healing journey. ‘Miguel Dean is quite a phenomenon. I did a telephone session with him and it was not like any healing or therapeutic session I have done before. Initially I found myself spilling out some of the grittier painful experiences of my life. I felt like I was talking to someone who would not judge me or be daunted by what I was saying. As I talked more emotionally I felt some tension coming into my body. I was laying bare some things with emotion I don’t usually feel comfortable showing. Miguel would make calming comments here and there. He has a poetic and broad view. Towards the end of the session when my emotions had created quite a bit of tension in my body, I suddenly felt and saw a bright light in my third eye. I felt the tension release in relief. Then I felt his very earthy energy surrounding me, and moving up my spine in a strengthening way. I felt how I naturally push men away, but he just held me steady energetically. It was an interesting grounded feeling I have never had before. I am happy to have Miguel in my life, and I know there are times when he will the person who will hold me steady as I go through things I wouldn’t normally tell another person. ‘Miguel Dean is a rare find indeed; man who actually understands a woman at core level. A truly gifted listener Miguel holds one of the safest sacred spaces I have ever experienced. Through my Sacred Masculine sessions, Miguel has skilfully helped me discover hidden aspects of my being as woman. On this journey I discovered the hidden fragmented soul parts that fled long ago and he supports me to weave them back in using incredibly insightful words and other creative media; all tailored to my unique perspective to create a sacred space, a SANCTUARY where I can examine in tender presence of a truly loving man and begin to really enjoy all the gifts I possess. Including all the hidden gems my experience gifted me along the way. To do this Miguel draws upon his wealth of personal and professional experience.